How Do I Saute Already-Cooked Shrimp? Shrimp are relatively delicate, and it is easy to overcook them, rendering the bite-sized shellfish tough and chewy. It is possible to sauté cooked shrimp without ruining their texture, but you must be thoughtful about how you approach the task. Ultimately, you are re-heating the shrimp rather than cooking them again. 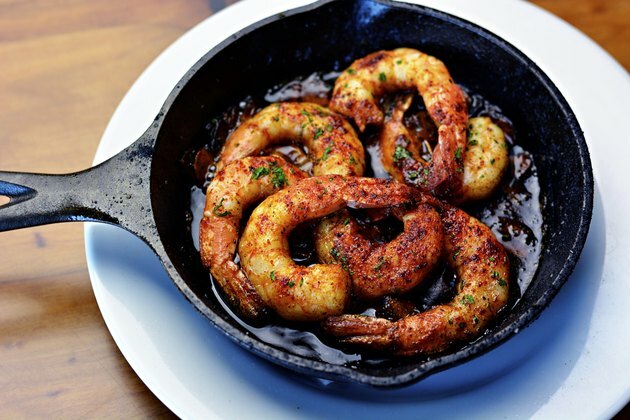 Even with careful, quick heating, however, you should be able to brown the shrimp slightly to create the savory, caramelized surfaces characteristic of sautéed foods. Cooking not only heats food but imparts flavors. Since you won’t sauté the shrimp for more than a few minutes, there won’t be enough time to impart substantial flavor while they are in the pan. If you want robust flavor, marinate the shrimp before sautéing them. Soak the shrimp with or without their shells for two to 24 hours, covered, in the refrigerator. An acid such as vinegar, wine or citrus juice would toughen the uncooked proteins of raw shrimp, but it's safe to use an acidic marinade on cooked shrimp since the proteins are already denatured. If you marinate the shrimp, include a little bit of a sugar or an ingredient rich in natural sugars, to encourage quick caramelization when you sauté them. Cook any other ingredients thoroughly before incorporating the shrimp. For example, if you want to prepare a stir-fry with shrimp and vegetables, fully sauté the vegetables before you add the shrimp. You should only heat the shrimp for a few minutes, until they are warmed through and start to caramelize. Add the shrimp as the final ingredient so that you can remove the dish from the heat as soon as the shrimp are heated through. Remove the shells from the shrimp before you sauté them. Add butter or olive oil to a skillet preheated to medium immediately before you add the shrimp. Fat prevents the shrimp from sticking to the pan or developing a dry, tough surface. It also aids in caramelization and adds flavor. Since the shrimp are already cooked, you do not have to heat them to a specific internal temperature to ensure food safety. Sauté the shrimp until the surfaces start turning golden brown. Create a simple sauce in the same pan while the shrimp are heating, if desired. A simple sauce typically contains a fat, an acid, herbs and spices. For example, add salt, pepper and fresh herbs to the butter or oil you are sautéing the shrimp in. As the shrimp start to brown, pour some balsamic vinegar or wine into the pan to deglaze the bottom and complete the sauce. Shrimp lose heat quickly due to their size; serve them immediately after you remove them from the heat.